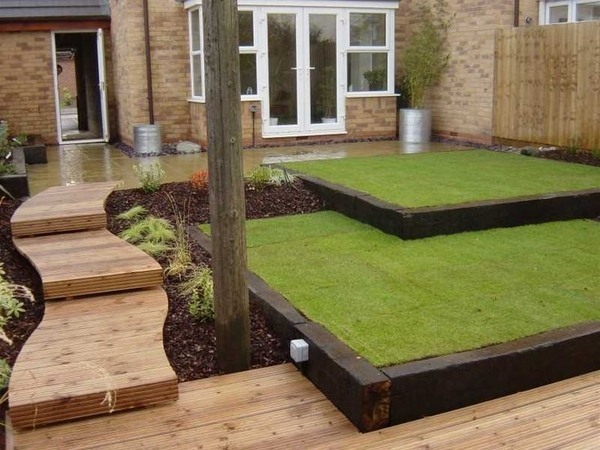 How to use garden sleepers in the design and the landscape of the garden? Are they safe or dangerous to human health? 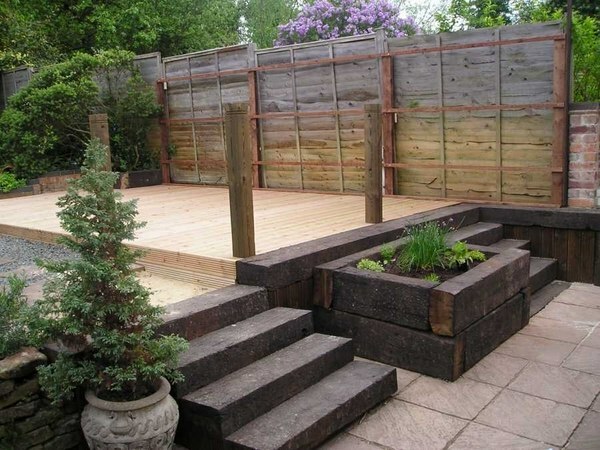 The use of railway sleepers has been a disputable topic and has as many supporters as enemies. 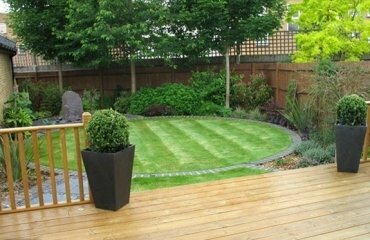 Of course, it is up to each individual to decide whether he will use sleepers in the garden and to get informed for the potential threads. 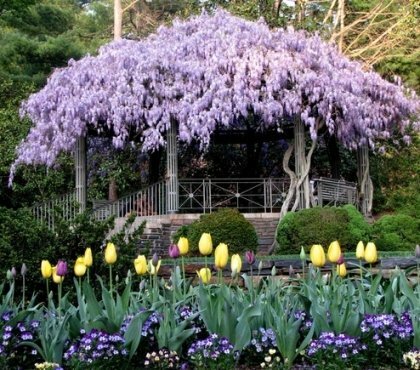 We will show you creative landscaping design ideas and different ways to use them for various purposes and of course, we shall look at their pros and cons. 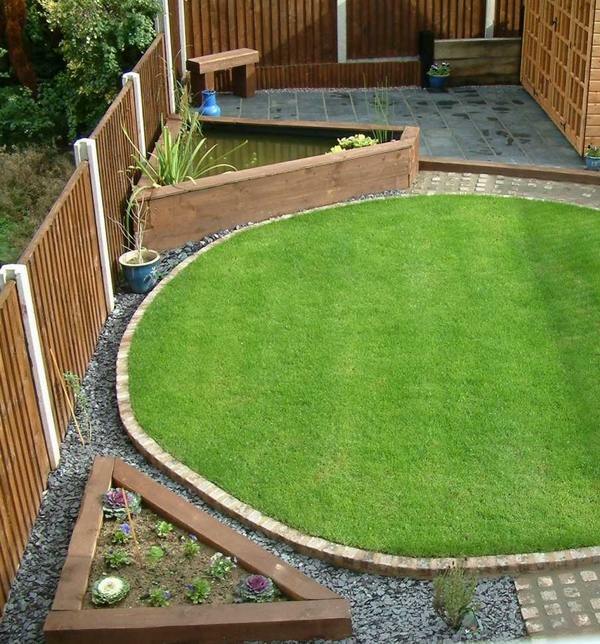 How to use garden sleepers? 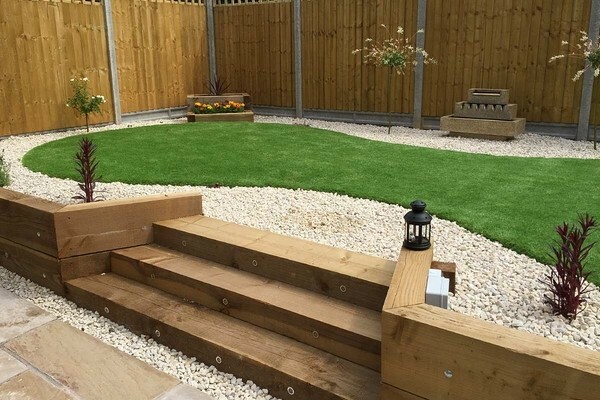 There are numerous ways to use garden sleepers – they are very useful if you wanted to build a retaining wall, they can be used for garden paths or steps, they are a useful and cost effective material for raised beds, as well as for garden edging. 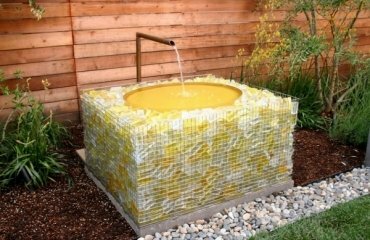 In addition one can easily make a bench or a decorative wall or even a privacy wall. 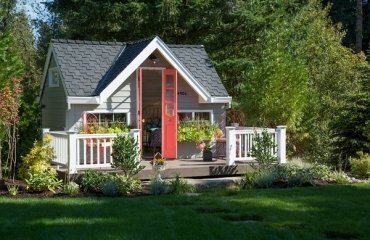 Another project is to build a fence or a patio deck. Railway ties are often used to build large structures such as pergolas, awnings, railings, bridges, terraces and to reinforce the construction of decks and terraces on slopes. 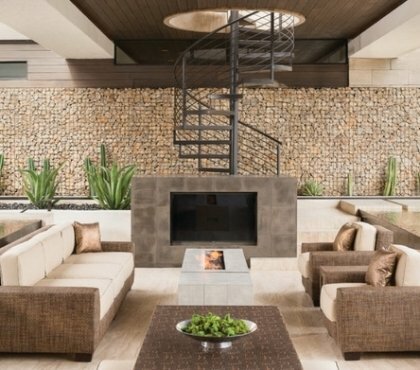 Their popularity is not a surprise because they are a very interesting element of the outdoor area architecture. 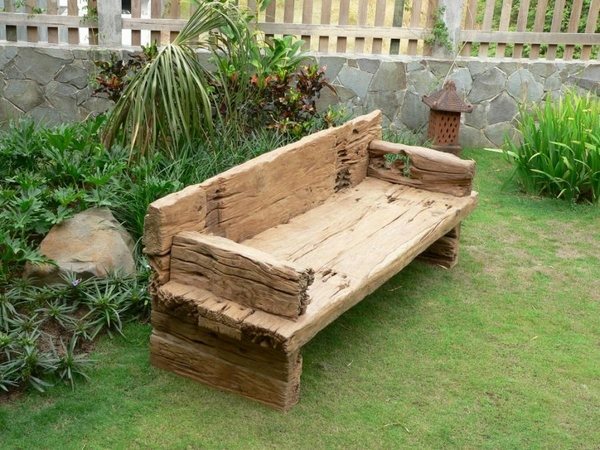 Their long and wide shape, texture of old wood and original brown color makes them a desirable material for the landscape and decoration. 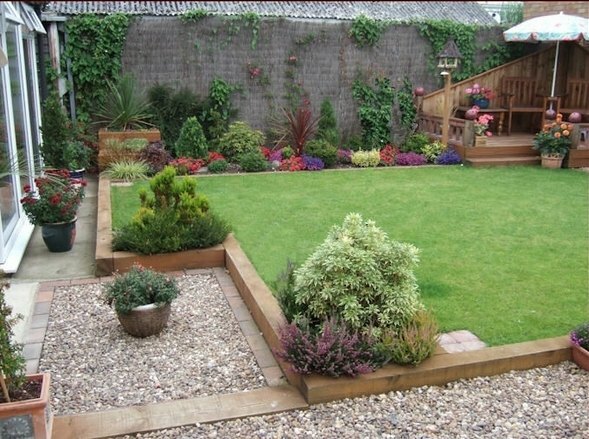 Garden sleepers have a unique look and add a lot of character and originality to the landscape design. They are a cost effective material and their greatest advantage is the durability as they have to bear enormous weight. 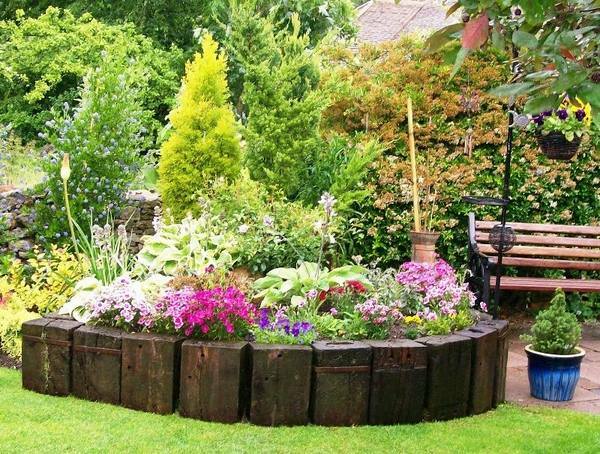 The most popular type of railway sleepers is made of hardwood – mostly from oak and beech and much more rarely from concrete or steel. 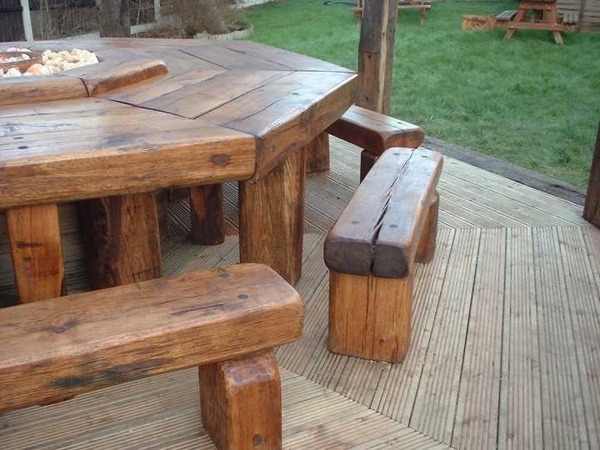 The natural properties of wood make it a number one material for almost two hundred years. Wooden railway ones are comparatively cheap, weather resistant with good insulating properties for vibration and noise and they are relatively easy to transport, install and maintain. 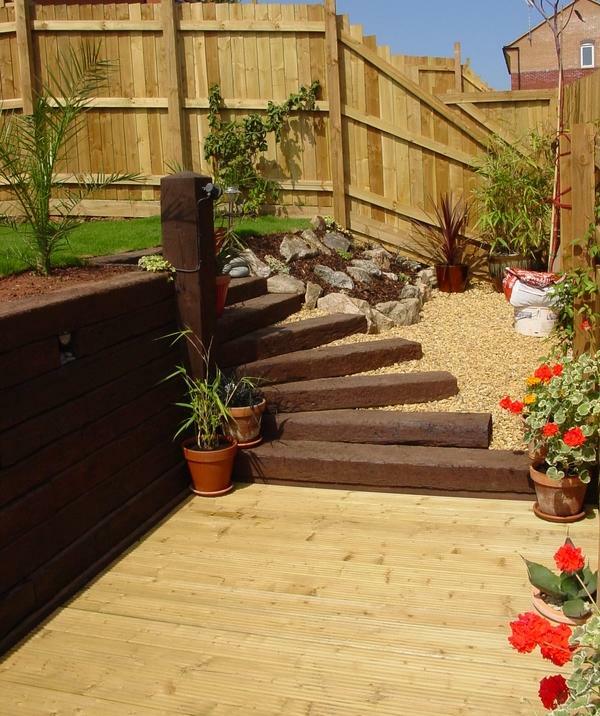 Despite of their great popularity, we have to point out a major con – timber railway sleepers are treated and impregnated with creosote oil, obtained from coal tar fraction. Despite the fact that creosote extends the life of wooden sleepers and prevents the growth of fungi on the wood and insect infestation it is poisonous and a big toxic hazard. It is not recommended to use them in playground areas, slides, ladders or tree houses or places where little children spend a lot of time. If you bought them from a reliable seller he should inform you if they are suitable for use and whether they have been treated or not. 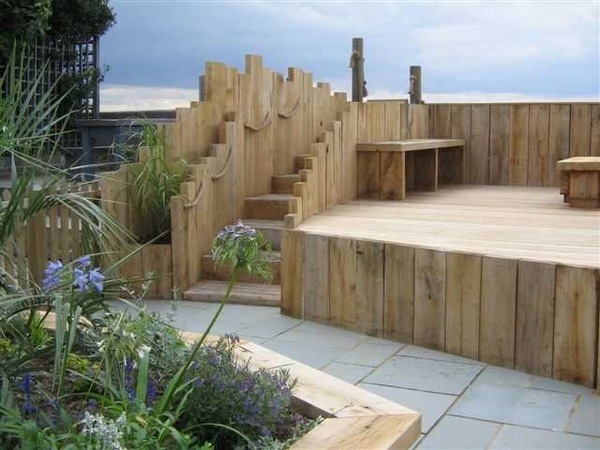 Now that we cleared the pros and cons of garden sleepers, let’s look at the different ways to use them in the landscape design. 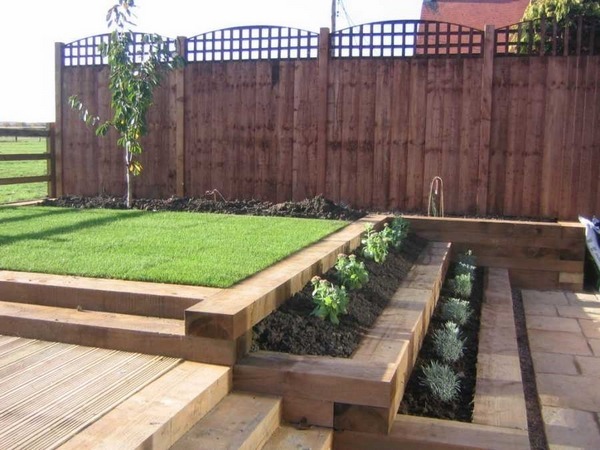 Raised beds and borders with railway sleepers are among the most popular projects. 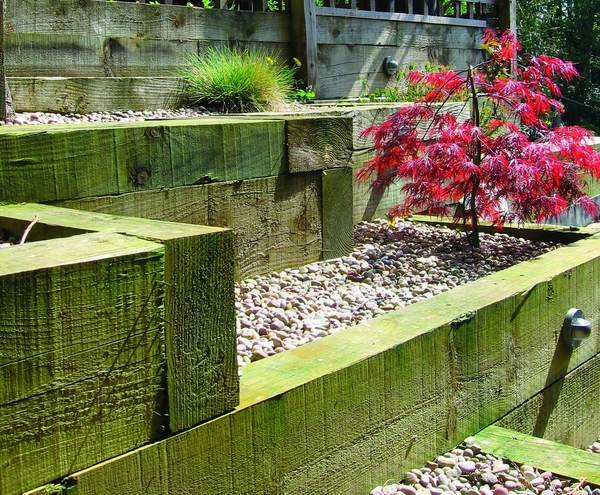 New or reclaimed sleepers are a great way to save on landscaping costs as they are a good and considerably cheaper alternative to bricks or stone. 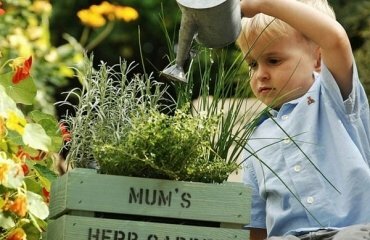 Wooden railway ties can determine the perimeter and the different areas in the garden -flower beds and lawns – and separate the different decorative elements. 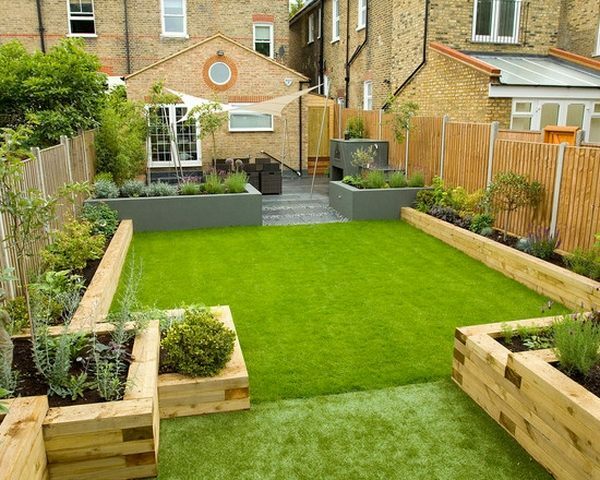 Placed horizontally or vertically, a raised bed will surely attract the attention. Railway ties can be used for the construction of both vertical and horizontal walls. Due to the durability to heavy load, they are especially useful to support the soil when you want to level a sloping site. 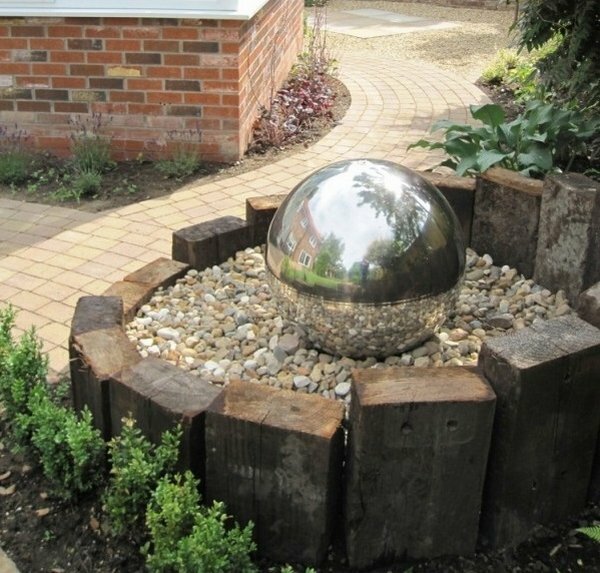 New sleepers can add a contemporary look to the garden and set the whole design. 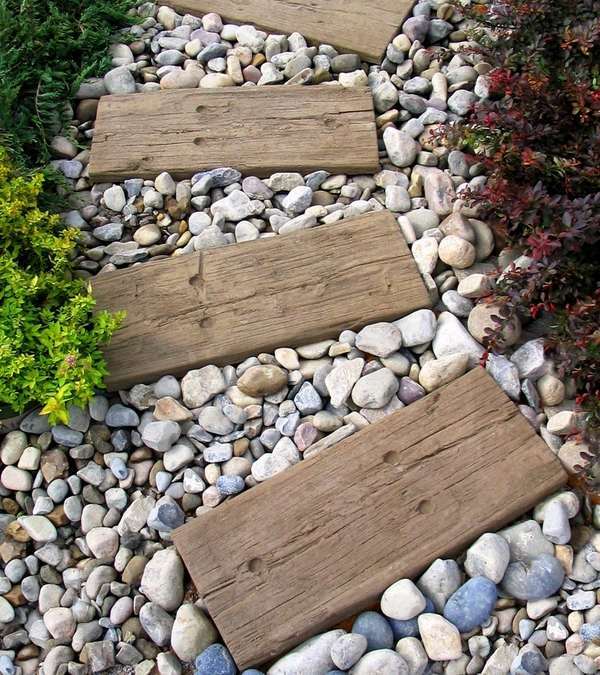 When you wonder for a suitable material for a garden path, railway ties would be an excellent solution especially for rustic garden designs. 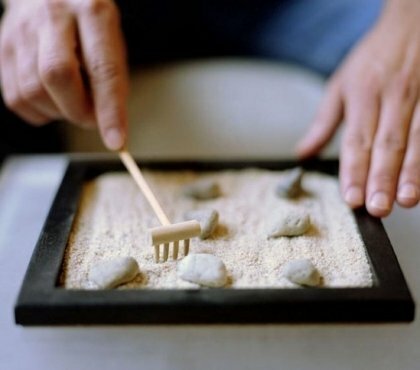 Combined with gravel they have an old-school charm with somewhat nostalgic appearance. Due to the fact that they are made of hardwood, your path will look good for many years. 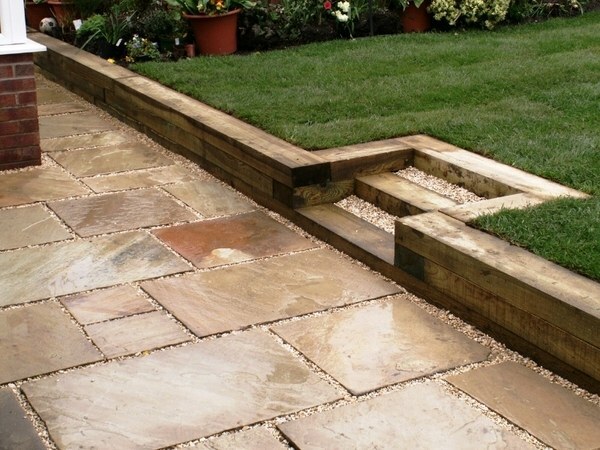 To keep the attractive look of the pathway, mount it on a concrete base and make sure you have a good drainage. 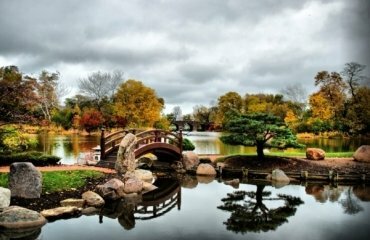 Besides that the path will not need much maintenance. 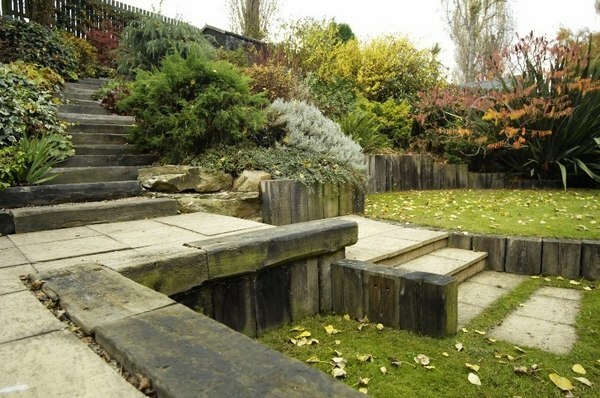 Garden steps made of sleepers have an original look and timber sleepers can be used for various designs. 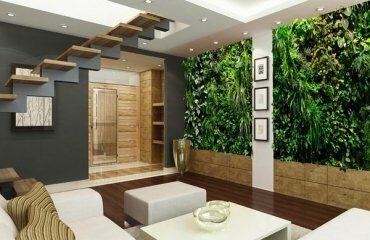 From just a few simple steps to winding flight of stairs or stairs on a hillside – there are numerous designs with a great visual appeal. 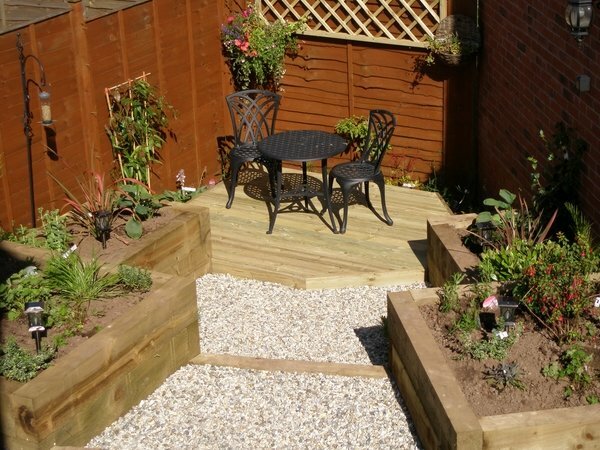 Building a deck with sleepers will allow you to avoid the cost and mess. 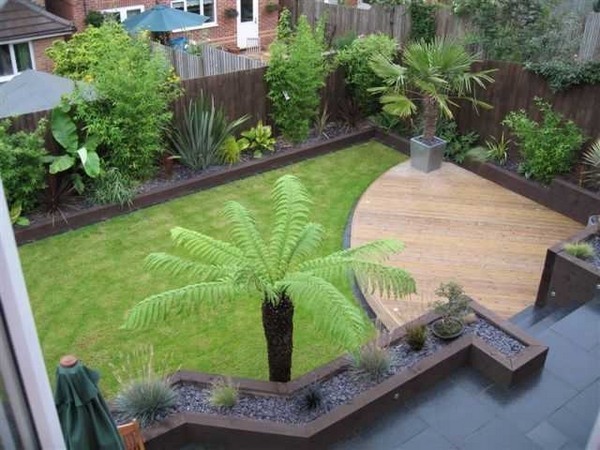 An advantage of a railway sleeper decking is that you can install it over a concrete slab or in narrow and tight places where heavy machines cannot be used. 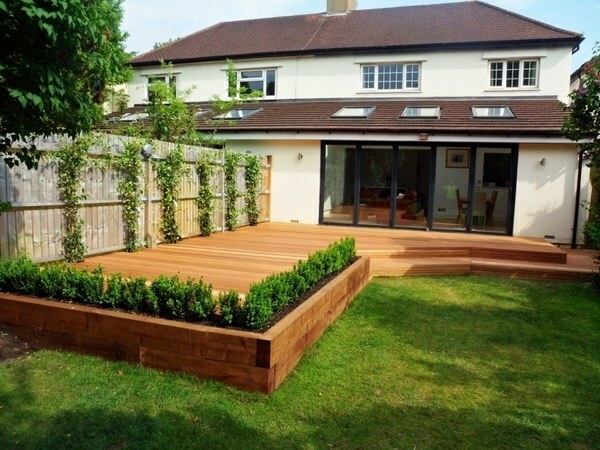 Wood sleepers are quite solid and are ideal to be placed between the deck surface and the ground as a supporting decking structure thus allowing an air flow beneath the deck and moisture drainage. 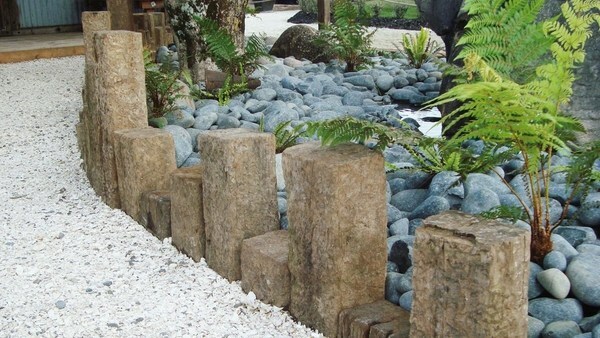 They can be used in many other projects – a bridge for the pond, a bench, a privacy wall or as elements in the decoration. 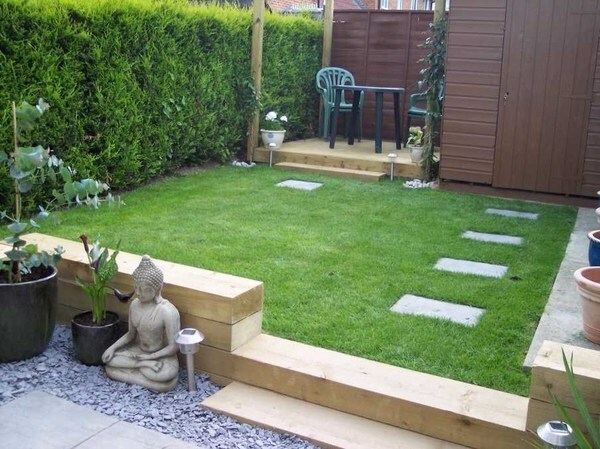 The great popularity of garden sleepers is mainly a result of the low price offered by sellers and the original and rustic appearance of old wood. However, inform yourself of the potential threats and we will remind you that it is best if you took the experts’ advice and avoid using wooden railway sleepers as they are creosote-coated. 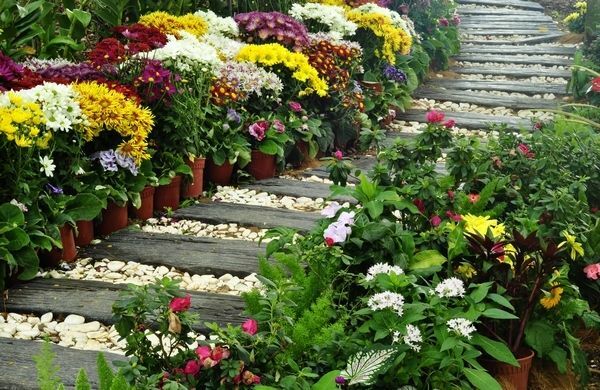 The chemicals which provide the resistance to weather and heavy load as well as rot- and insect-resistance may cause health problems.